in Tokyo. Photo by Atsu. A Japanese popular manga and anime “Tetsuwan Atom (Mighty Atom)” became computer animated film in the U.S.A. It is titled “ASTRO BOY” in English. The creator of “Tetsuwan Atom,” Osamu Tezuka (1928-1989), wrote first Atom manga in 1951, and it became anime in 1963. 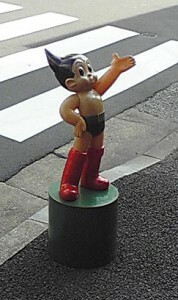 Since then, Atom has been one of the most famous characters in Japan. Now it’s about to be famous in all over the world. The film will be released in 58 countries. Imagi Animation Studio, who produced the film, worked on with Makoto Tezuka who is a Japanese film and anime director and also Osamu’s son. For the past two years, they worked together to figure out how to keep the spirit of the original Atom works. Here is an interview with Makoto Tezuka by Nikkei Newspaper (Nikkei Shinbun). ——On August 19th, Makoto Tezuka was invited to Imagi Studio in LA to see a preview of ASTRO BOY. Original Atom is an elementary schoolchild but in the film, he is an early teenager. The production wanted to target audiences over teenagers; therefore, the age of Atom was set older in the film. “Since ancient Japan, the Japanese admire small things and that is originated from animism.” Makoto explains. Original Atom features eye lashes; however, in the western culture, drawing eye lashes on a boy character is not acceptable as he looks girl-like. As a middle course, the upper eye-lids were drawn thicker. In the story creation, they considered both Japan and the West values. The film describes Atom’s life since he was born till he finds the place where he is accepted. Atom was created by a scientist who lost his young son but the scientist gets disappointed at Atom because he doesn’t grow up, so he kicked Atom out of his house. Makoto asked the production to not describe Atom as a runaway boy. Yoshihiro Shimizu in Tezuka Production told Nikkei Newspaper. The film will be released on October 10th in Japan, October 23rd in America.